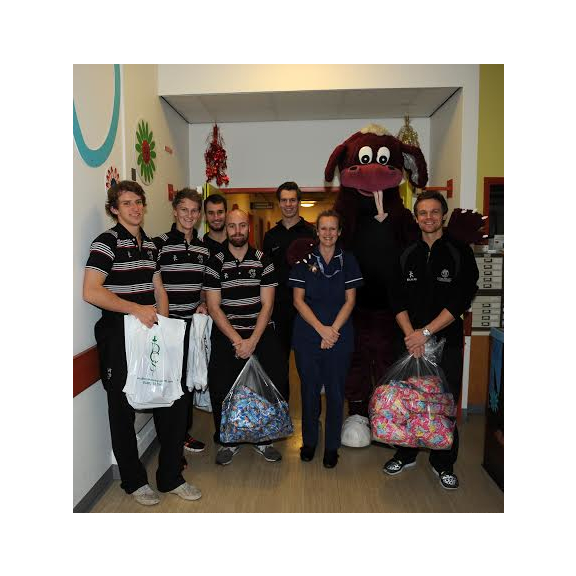 Somerset Players Deliver Christmas Presents to Children’s Ward. Christmas came early for some local children this week when some of the Somerset CCC First XI visited the childrenâs wards at Tauntons Musgrove Park Hospital. James Hildreth, Max Waller, Lewis Gregory, Adam Dibble, Jack Leach and Chris Jones were joined by our mascot Stumpy as they went on a tour of the Oak and Acorn Wards distributing presents and gift bags. The players also took the time to chat to the children and their families. Caroline Jackson, the Ward Manager for the Childrenâs Unit, took the players on their tour: âIt was really goodâ she said. The children especially loved meeting Stumpy! Weve got a wide range of patients at the moment including many with special needs and its really nice for them to meet different people. I think everyone loved it. It was really thoughtful of the players to come and bring gifts for everybody and its been a really good experience. Spencer Bishop from the Clubs Commercial Department helped to organise the event and is pleased with how it went: The players were really keen to go to the Childrenâs Ward to help spread a little bit of Christmas cheer and they definitely did that. The looks on the faces of some of the children was priceless and I think the players will have taken a lot from this visit too. I would like to thank Caroline Jackson for taking us around the wards and I would also like to thank Morrisons, Sainsburys, Debenhams, The Entertainer, Austins Department Store and Somerset County Sports for donating toys, games and gifts which helped to make this event such a great success Chief Executive Guy Lavender is delighted that the visit was so successful: As a Club we have a duty to give something back and our Community Engagement Programme is designed to do just that. It is vital that we continue to contribute and help out where we can within the local area. Visits like this are part and parcel of what we believe in as a Club."